Most of the first day’s walking has been through man-made landscape. After the source and the early headstream of the infant river had been left behind the hand (or more accurately for the water park the JCB) of man has been responsible for shaping my surroundings. Now it is time to restore the balance with a dramatic return to natural land use. I have arrived at one of the finest tracts of uncultivated meadowland that we have left in these islands, the tranquil and unspoilt North Meadow. The use of the land of North Meadow has been carefully regulated throughout the ages under the strict control of the local official known as the “Hayward”. In olden days the hay cutting would begin on July 1st, and cattle were not allowed to graze on it until Lammas Day, which falls on August 1st. Horses were then permitted to run free on the meadow from September, and sheep were allowed to join the party shortly afterwards until winter set in. On Candlemass Eve (February 12th) it was a case of “everybody off” in order to let the hay grow again. Several ancient carved stones still stand on the meadow to mark the boundary positions of the old hay lots. Many centuries of the constant cycle of hay cutting and grazing interspersed with occasional flooding have made this place into a botanists dream. Occupying 110 acres between the River Thames and the River Churn the meadow is filled with colourful flowers. Plants found here include adder’s tongue, great burnet, marsh marigold, water crowfoot, buttercup and celandine. However, the flower that this haven is most noted for is the one that many visitors come here at this time of year specifically to admire. Flowering in late spring, this is the home of the Snake’s Head Fritillary. Fritillaria Meleagris to give its full Latin name is one of our rarest flowers. The name is derived from the Latin fritillus which translates as “dice box”. This alludes to the chequered pattern seen on the flower. Approximately 80% of all of the wild plants of this species found in Britain live in North Meadow. The plant can also be found in smaller numbers at Ducklington near Witney, which has its own Fritillary Festival to celebrate the flower. Later on during the walk I will pass Magdalene College Field in the city of Oxford which is where most of the remainder are to be found. The plant varies between 15cm and 40cm in height and has a nodding bell-shaped flower of around 2cm in diameter. The Snake’s Head variety has a chequered reddish-brown purple appearance, but occasionally also appears in white. 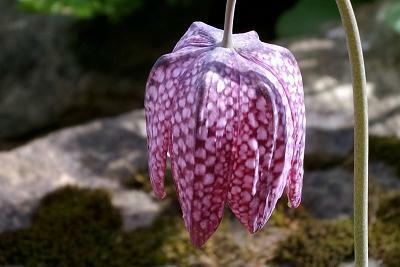 At one time the fritillaries were picked and sent to Covent Garden, but now they are considered to be an endangered species in the wild and as such are vigorously protected. Cultivation of meadowland has been responsible for their demise in all but the three places in England, but here on North Meadow they happily flower and proliferate. From a distance the meadow appears to possess a purple tinted haze, but as I approach and can see the finer detail the haze is the effect of literally millions of the small purple flowers. The purple colouring is interspersed with the occasional white specimen, and there are some additional bright yellow dots caused by the presence of dandelions. A quick something here for any quiz buffs. The fritillary is the official flower of the Swedish Province of Uppsala and also appears on the national symbol of Croatia. As the man said, “Not a lot of people know that”. If you win a pub quiz because of that good luck to you. (And a pint for me too please). The area fair buzzes with insect life. Butterflies and damselflies are seemingly everywhere, and the river, which is still no more than a stream, attracts reed bunting and sedge warblers along with some stately-looking swans who patrol the waters with an arrogance that makes it appear that they think they own the place, and not (as we shall see later on the walk) the other way around.